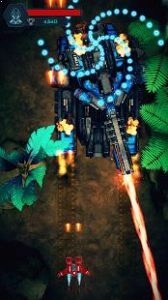 Galactic Attack Alien : This stunning shoot ‘em up (or shmup) game combines the classic arcade elements with the new modern rendering and incredible electronic soundtrack. Galactic Attack: Alien offers gorgeous 3D graphics, intense gameplay and a lot of features. The options to boost up your spaceship are incredible. Fire up your spaceship – enter this space shooter to save your galactic from alien swarm attack! Fight against heavy bosses. Use bullet time to dodge incoming rockets! Join the war in this fast paced galactic shooter! If you are fan of shoot ‘em up (or shmup) game, you must play “Galactic Attack: Alien” now and become a hero protect your galactic that your destiny. The Galactic’s future is now in your hands. Get your weapons ready for epic battles.